Collaborative reflection helps groups to learn from work experiences for future work. Although its potential has been recognized and initial work is available, insights on how tools support people in collaborative reflection at work are scarce. We present an approach to analyze collaborative reflection support based on content analysis and an initial study in which it was applied to four cases of using a tool for collaborative reflection. From this we derive design suggestions such as levels of support for different groups and support for the creation of results from collaborative reflection. 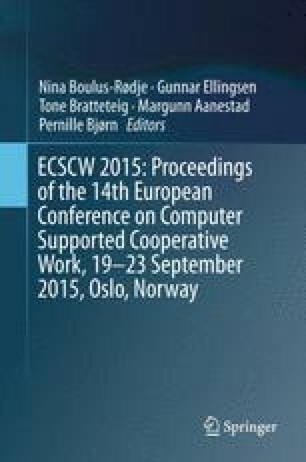 Our work contributes to CSCW by showing how tools can foster collaborative reflection at work. Fleck, R., & Fitzpatrick, G. (2010). Reflecting on reflection: framing a design landscape. In Proceedings of the 22nd Conference of the Computer-Human Interaction Special Interest Group of Australia on Computer-Human Interaction, OZCHI’10 (pp. 216–223). Brisbane, Australia: ACM. doi: 10.1145/1952222.1952269.